Staying fit is an important part of everyday human life and to do that exercise is the essential need therefore thanks to the adjustable dumbbells set, it is now easy to get started. It’s a very tough job to choose the best one when you see a very wide variety. That’s why we have compiled a list of the Top 20 Best Adjustable Dumbbells so you can have a look at the best and choose the one which suits better with your exercise and comfort. There are a number of factors to be considered before purchasing a pair of adjustable dumbbells. Those factors are the weight range, nature, features, design, color, comfort, durability and manufacturers. That’s why it is not going to be an easy decision. Our top 20 list shows the Best Adjustable Dumbbells available, from the workout experience by professionals across the globe. 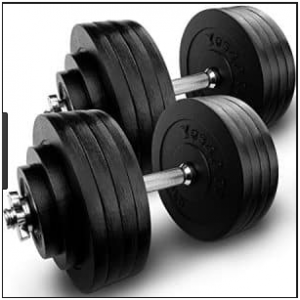 I recommend you to read our Adjustable Dumbbells Buying guide below before making a purchase. Below is the table which shows the top 20 best adjustable dumbbells 2017. Each and every dumbbell is chosen by our specialist reviewers. 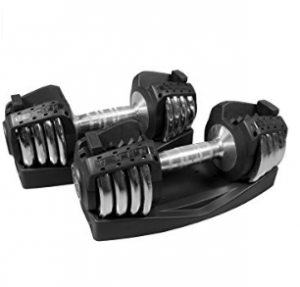 Bowflex SelectTech 552 Adjustable Dumbbells. Our First Adjustable Dumbbells are from Vancouver, Washington known as BowFlex. The BowflexSelectTech 552 Adjustable dumbbells are no doubt the most popular dumbbells ever produced by this company and the model ST552 are the most used and highly rated of all time. This is the reason why it’s on Number 1 on our list. 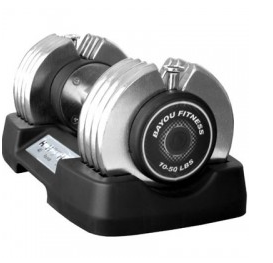 These dumbbells provide a great range of adjustable weight starring from 5lbs to 52.5 lbs. Increment of weight starts from 5lbs with 2.5lbs each increment for the first 25lbs. There is a dial at the end of grip to select the number of weights hence we can see without holding what is the actual weight right now. The best part of these dumbbells is that they replaces 30 pairs of traditional dumbbells means you are saving money of around 30 dumbbells and investing comparatively less on one so yeah it is very pocket friendly. With BowflexSelectTech you are getting a free Bowflex training app which is compatible for iOS and Android and keeps you updated with the workout, daily progress and cardiovascular activity. The only downside in BowFlex 552 is that it is missing the Bluetooth compatibility. However, this feature is available in the other variant of Bowflex series 560, known as Bowflex ST560 which is quite expensive. Plastic is used to hold the weights in place. Wide range of Adjustable weight Gives ample warning in the manual. Occupy very less space than the natural dumbbells/ Very Expensive. Simple and compact for a quick home workout. Soft grips in hand and quick to adjust. The next one in our list is from Yes4All. 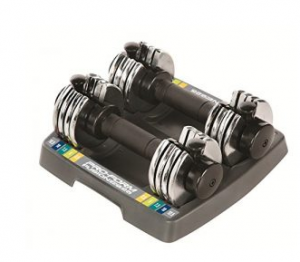 These adjustable dumbbells launched by Yes4All are of the favorites in our list due to their quality and durability. They are also used widely because theygives a very old school look than the other adjustable dumbbells. Having ergonomic textured, Solid Chrome Handles makes the Yes4All adjustable dumbbells very firmly to handle. The texture increases the friction between the hand and rod making it to be held as tightly as possible. The high performing rust resistant SOLID CAST IRON PLATES with a wide variety of 4: 3-pound plates, 4: 5-pound plates and Four collars making it 40 pound of two handles gives a good range of weights. 50lbs set= 2 Handles, 4 Collars, 4 3lbs weights, 4 7.5lbs weights. 50lbsset= 1 Handle, 2 Collars, 8 5lbs weights, 2 2.5lbs weights, 2 1.25-lb weights. 60lbs set=2 Handles, 4 Collars, 4 5-lbs weights, 4 8-lbs weights. 105lbs set =2 Handles, 4 Collars, 16 5-lbs weights, 4 2.5-lbs weights, 4 1.25-lb weights. 200lbs set=2 Handles, 4 Collars, 4 2.5-lbs weights, 4 5-lbs weights, 16 10-lbs weights. Yes4All dumbbells gives a 60 days return and 5 Year warranty on weight plates and parts which shows how the manufacturers are so confident in these dumbbells. The issue we faced using these dumbbells was that the star twist clamp doesn’t stay tight enough for safe heavy lifting which causes the weight to be checked constantly for safety. The changing of the weights can really slow things down if you’re trying to knock out quick sets. Budget friendly Weights are greasy which gives a bad smell. Very good handling due to textured solid chrome handle. Weights are of low quality and after a while chips starts falling from it. Weights on the end do not wobble while lifting and are locked in light. Changing of weights slows the workout. Great for curls, snatches, rows, light presses. Weights looks used. Collars gets loosen as you use the weights. The next in our list are the Unipack Adjustable Dumbbells by a renowned company Unipack which makes many gym equipment. 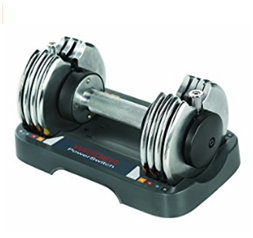 Unipack Adjustable Dumbbells aremostly used standard fixed weight dumbbells due to their flexibility of adding or removing the weight from the bar depending on you. CONTENTS AND WEIGHT – two bars, four collars (two for each bar), 52.5 lbs. weights for each dumbbell broken down into Eight 5 lbs. weight, Two 2.5 lbs. weight and two 1.25 lbs. weight. These weights gives a total of 47.5 lbs. whereas the weight of the bar is 5 lbs. The weights are constructed from cast iron having a black paint therefore weights do have a few chips in start, but that’s not a big concern since you will be using only bar to lift the weight. It is very easy to add and remove weights from the bar. The collars consist of a screw to remove it for this purpose. Budget Friendly. Rubber thing on the bar falls easily. Great for quickly trying to move up in weight sets. Bar is very rough on the hands. The bars at 16" and easily accommodate all the plates Paint chips off of the plates. The next adjustable dumbbells are from Bowflex Series knows asBowflexSelectTech 1090 Adjustable Dumbbells. 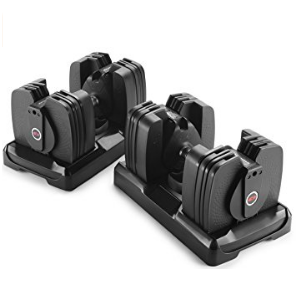 These dumbbells are one of the latest additions in Bowflex Series with a model number of ST1090 and are no doubt the most popular product used. The reason of this model’s popularity more than theBowflex model ST560 and ST552 is because of the additional features which make model ST1090 stand out than others. The BowflexSelectTech 1090 offers a great range of weight to start your workout with, starting from 10 lbs. and going all the way up to 90lbs. per dumbbell. The weight is varied with 5lbs increment, which offers you around seventeen different weight settings to choose from. The twist of a dial can change the weight from 10 lbs. to 90 lbs. with nearly no work making to do your workout as quickly as possible. Gives Bluetooth connectivity and Free App for iOS and Android. However, there was no Bluetooth in BowFlexSelectTech 552. The only drawback in BowFlexSeriesTech 1090 is that when doing a workout of heavier weights the plates starts falling down which may lead you to severe injury. Good Range of weights(10lbs-90lbs) Very Expensive. Saves plenty space thAn natural dumbbells. Weight Slips Off. Saves time due to quickly changing of weights. Grip seems a bit slippery at first. Molded tabs on plate which doesn’t locks. When it comes to old school CAP Barbell 40-Pound Adjustable Dumbbell are the best one for beginners and advanced fitness enthusiasts. The reason CAP Barbell 40-Pound Adjustable Dumbbells are in our list is due to the versatile weight set provides the tools needed to create your own customized routine with your preferred amount of weight. With carrying case included,the CAP 40-pound weights areneatly organized and easily accessible at the time you wish to turn on the heat. The Forty pound set includes 2 handles, 4: 2.5-pound plates, 4: 5-pound plates and 4 collars. The cast iron plates are durable and come with a semi-gloss finish for rust and long-lasting good looks. You can even use these dumbbells with bare hands rather than using gloves because the steel barbell is knurled to help ensure a steady, secure hold giving you a safety, stability, and a more comfortable fitness experience. 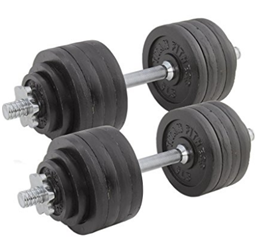 There are also few drawbacks in CAP Barbell 40-Pound Adjustable Dumbbell like the collarshaves a very cheap layer around them that will easily chip off and may lead the weight to fall down. The weights are a bit of reeking so it is preferable to use them in a garage or open air. Budget Friendly. Weights seems a bit smelly. Carrying case sets the weight neatly and well organized. Collar seems to be a bit loosen and doesn’t tightens up the weight. Cast iron plates are durable with semi-gloss finish. The Bayou Fitness Adjustable Dumbbells are one of the finest of its kind. In our list they stands out from the rest by their look, feel and functionality. In Bayou Fitness Adjustable Dumbbells there is a functionality of a knob or a twister which can be added either side of the weight by simply twisting it to your desired value. 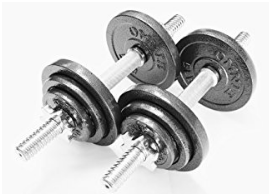 The tough chrome plated steel construction shows that they are very long lasting and the plastic metal case helps the dumbbell to be secure at their place. 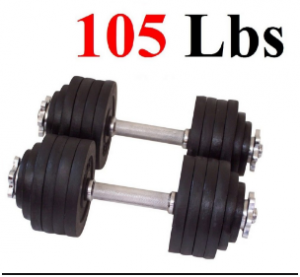 They have a thirteen inch long handle, with the weights varying between 10 to 50 pounds. The standard 50lbs. dumbbell is Fifteen inches long and Eight inches wide. With 5 pounds increment the dial system has 9 settings which helps you to switch between weight from 10-50lbs. The lever system works such that once you dial the weight you need, the required set of plates is locked onto the dumbbell, while the ones you don’t need are released onto the tray. There is a big drawback in Bayou Fitness Adjustable Dumbbell which is that the dials are harder to fix if they break. The 10 pound increment can be viewed both positively and negatively. On the positive side, it is ideal for experienced weightlifters. On the negative is that a graduation of that size may be a little too much for the muscles. Switching between plates is very easy due to knob. Dials are harder to fix if they break. Shows durability due to its manufactured material. Seems very bulky in the hand. OMNIE is the only real choice when it comes to comfortable, environmentally friendly and cost-effective whole house systems and therefore its wide range of adjustable Dumbbells makes to the list. These dumbbells come as a set with two handles and 100 lbs. worth of plates for each one of them. In other words, the set consists of 2 handles, 4 collars and 24 weight plates with a weight increments from 5 lbs. up to 100 lbs. (45.3 kg) for each dumbbell. The Omnie dumbbells are full-iron. There are no plastic inserts or any other elements in their construction, rather than the plates, collars and bars. The plates are manufactured with cast iron, while the bars are constructed with Heavy Duty steel. The bars are standard, steel-made, with knurled handles to provide a superior grip. They’re coated with a layer of chrome, in order to prevent rust. 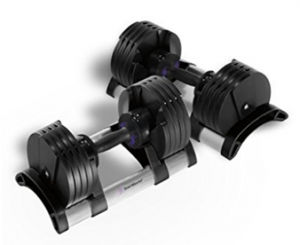 The Omnie dumbbells feature the same classic adjustment system as the Yes4All. You simply load the weight plates onto the bars, secure the collars on the threaded sleeves, and start exercising. It’s not exactly the fastest adjustment system, but on the other hand it’s extremely secure. Solid, durable construction. Adjustment takes a bit long compared to PowerBlock dumbbells. Space-saving. The nuts slip/loosen after being tightened which allows the weights to start shifting. Versatile, easy to adjust, great for alternating exercises that require different weights. The rubber washers last no time. Durable, corrosion-resistant finish both on the plates and handles. Starring 65 105 200 Lbs. adjustable dumbbells of (Ringstar) are the one to whom not everybody inquisitive about obtaining a far better body through strength coaching. 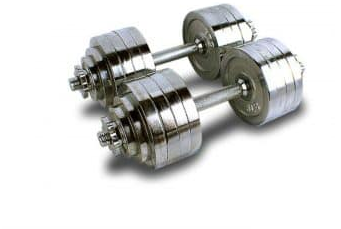 These dumbbells are in our list of top 20 due to their quality, range of weights and durability. All plates are durable, functional, and product of quality spray painted forged iron. 4 laptop dumbbell of weights. Four pcs 1.25 lbs. dumbbell weights. Four 2.5 lbs. dumbbell weights. Sixteen 5 lbs. dumbbell weights. Four pieces 2.5 lbs. dumbbell weights. Four pieces 5 lbs. dumbbell weights. Sixteen pieces 10 lbs. dumbbell weights. Plastic trays prevents the best dumbbells from rolling and thus protecting your floor. However,the biggest criticism I’ve to examine is that the paint peels off after couple of tries. Therefore, it is recommended to purchase the silver unpainted version. Easy to adjust Sprayed on black paint easily strips. Excellent pledge for a dumbbell set. The handle is also a trifle abrasive for beginners. Anti-slipped handles for easy uses. Chrome end on handles, black enamel on weight plates keeps rust away. Next in our list there are adjustable Dumbbells from XMark. A company from San Francisco which provides a greater range of gym equipment. Xmark Adjustable dumbbells are the best for workout at home because of the great choice dumbbell set that is 50 pounds or less. The 50 pound pair of dumbbells can eliminate up to 9 regular pair of dumbbell sets. That’s a huge space saver and definitely a lot cheaper than buying them individually. There are actually 5 settings that you can adjust each dumbbell to which are 10, 20, 30, 40 and 50 pound increments. The dimensions of the dumbbells are Fifteen inches long, Eight inches wide and Nine inches tall which is a bit longer than most of the sets. Each plate is made of chrome plated steel, which offers endure greater durability. Neglecting the worry about corroding, rusting, or chipping after a time. The engravechrome plated, steel handle gives a very tight and protective grip. Deleting the worry about the dumbbell slipping out from hands during tough workout. When the hand becomes sweaty, a smooth handle bar can become very dangerous. The engravings allow you to maintain control over the dumbbell, hence decreasing the risk of injuries. However there was still a minor drawback while using them which was that the weight plates were sticking when first started doing the set. Easy to adjust the weight settings Weight plates were sticking at first. High quality handles that are easy to grip Slider system becoming ineffective, after a period of use. The number 10 is going to be from Weider with its Speed Weight Adjustable Dumbbells.The company Weider hasalways came up with a good quality adjustable dumbbell you’ll simply love, but let’s see what makes these adjustable dumbbells stand out from the rest. The weight ranges from 5lbs.- 25lbs. with 5lbs increment at a time provides you to switch on your desired weight at a time. This gives you a chance to strip the dumbbell down when you’re performing keeping apart exercises, and when you go with super sets it can help you throw the extra pounds back on. 11.5 inches long and 6 inches high won’t cover much space of your home so very space saving. The quality of the tray is heavy plastic which doesn’t break downs easily and you can slide down underneath your bed. However few drawbacks that weights are a bit stiff to move the pins from weight to weight. The plastic tray is adequate, but not very beefy. Adjusts from 5-25lbs Difficult to adjust weight. Comfort Grip Handling bit slippery. Number 11 on our list are the Dumbbells made of Cast Iron Chrome by MTN Gearsmith. 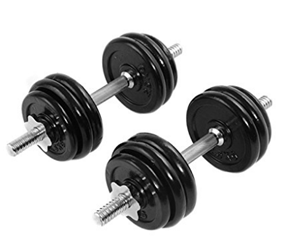 These adjustable dumbbells comes in different style and size of the adjustable dumbbell kit (52.5 lbs., 100 lbs. , 105 lbs. or 200 lbs.). The product has great versatility. It can be a great set for people of all skill level or expertise. All because of the adjustable weight and locking system, you can enjoy a light to heavy weight dumbbell ranging from 5 pounds to 100 pounds, provided that you have some expansion kit that costs extra. 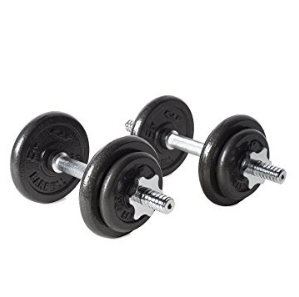 There is a choice of two between MTN Gearsmith Heavy Duty Adjustable Dumbbells from nice black finish coat or a chrome plating. Each piece of plate is made from a strong and sturdy construction of durable and long lasting cast iron. The handles are nicely threaded, allowing you to have a nice and firm grip for a steady lift. One thing to notice when you get these on a day that a very strong chemical smell is exposed form the newly weights. So by letting the weights out in air for some time may reduce that thing. Affordable. Some of the weights have rounded edges others have sharp edges. Durable. Strong Chemical smell from weights. Adjustable from 5lbs to 100lbs. Difficult to switch from one weight to another. Weights are beautifully chrome plated. 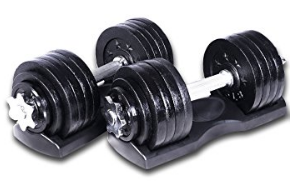 InfiDeals Adjustable Cast Iron Dumbbells with Solid Dumbbell Handles by Lion Roar Fitness make to number 12 in our list due to the old school look and wide range of adjustable weight. The Adjustable Dumbbells by InfiDeals are low-cost, but highly effective gym equipment for building muscles. The solid-steel, chromed-finished handlebars looks great, durable, and can resist rusting due to their moisture and sweat. It is also textured to make sure your hand doesn’t slip. The plates are made of durable cast iron, which are finished with a semi-gloss and corrosion-resistant paint. The 40 pound set includes two handles, four 3-pound plates, four 5-pound plates, and 4 collars. Adjusting the weight is done manually, but the plates are secured in place when the collars are tightly screwed in. With rubberized washers, a tight fit can be achieved without the need to use any tools. Once properly tightened, the plates won’t move around or clink with the other plates. The plates themselves are painted black, and some of the paint is scratching off but since they are cheap these minor things can be neglected. Cast iron plates with semi-gloss finish for visual appeal and corrosion resistance. Simple to use and offer more versatility. The idea of Adjustable dumbbells came from a company known as PowerBlock. 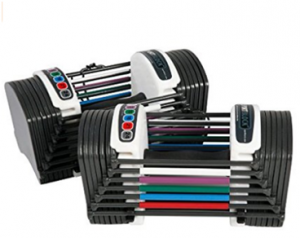 There PowerBlock Elite dumbbells have been sold mostly and highly rated by consumers in the market. The Elite series consists of three categories: the PowerBlock Elite 50,70,90. The number on the end tells the amount of weight one set comes with. The Elite 50 shows weight range from Five to Fifty lbs. and so does Elite 70 and Elite 90 starting from 5lbs. and ending on its mentioned value. As far as the adjustment is concerned, the PowerBlock Elite dumbbells are very user friendly and are easy to vary weight settings. The weight plates are shown in stacks having a color-coded mark to show the amount of weight in each stack. A huge plus with Powerblock Elite Adjustable Dumbbells is that you can even change weight in 2.5 lbs increments using smaller added weights that are attached with one of the inner parts of the dumbbell. It looks like a cage having four independent bars surrounded with handle, which are connected with each end of the dumbbell making it look standout from rest of the adjustable dumbbells. 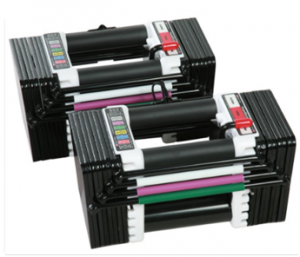 The PowerBlocks are High-Duty and can handle all types of regular gym abuse. There may be a minor drawback of PowerBlock Elite Dumbbells is that when you adjust weight in smaller increments like 2.5 lbs.or 5 lbs., it takes a little effort since you have to add the smaller added weights manually rather than using a selector pin to make your adjustment. Weight range is expandable. Expensive. 16 different weight settings Not having a natural dumbbell round shape. 10-year warranty so very durable. Easy to change between weight settings. 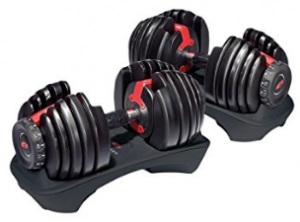 The last product of Bowflex in our list is BowflexSelectTech 560 Adjustable Dumbbells model number 100411. The BowflexSelectTech 560 Adjustable Dumbbells are the world’s first adjustable dumbbells, giving you a feel of great experience of working out harder and smarter. Each cutting-edge selector zed dumbbell can quickly be adjusted with dial settings from 5 to 60 pounds, each SelectTech 560 unit does the work of a full weight rack while taking up little space. The settings on Bowflex 560 Dumbbells are: 5, 7.5, 10, 12.5, 15, 17.5, 20, 22.5, 25, 30, 35, 40, 45, 50, 55 and 60 pounds. To choose a weight simply turn the equipment’s dial to the desired setting and the extra plates will stay behind. BowflexSelectTech 560 Adjustable Dumbbells gives you a warranty of 2 year on mechanical parts and 1 year on electrical parts. More than 30 exercises are supported in Bowflex app which is available in iOS and Android. There is also a Bluetooth connectivity supported which makes you listen music of your choice while training which ensures that you’re using proper form for strength training. LCD window show weight selected, Bluetooth connection, battery life and sound selection. Easy to use Very Expensive. Strength training with 5 to 60 pounds Electrical warranty is short. 16 weight settings	 Battery life is not good. Integrated Bluetooth tracking Sweat may damage LCD screen. Next in our list is a product of ProForm which is one of the most popular brands for different types of exercise equipment. They have already designed a lot of products with some pro features. This product is also one of the quality products by ProForm. Though the price is low, but the capacity of the ProForm 25-lbs Adjustable Dumbbell Set is impressive. There are two dumbbells included in this product. Both of them are 12.5 pounds. There are four plates on each side. They are highly portable and space saving. Each plate is 1.25lbs, every two plates equal 2.5 lbs. There are 8 plates total on each dumbbell totaling 12.5 lbs. with a firm plastic holder. The plates fit securely and don’t “feel” like they will slide out while you’re using them. These adjustable dumbbells are mostly recommended for women due to their size and weight. One drawback in ProForm 25-lbs. Adjustable Dumbbell is that the disks do not stand up straight which makes the handle difficult to get in between the disks when I set it back in to change the weight. Affordable. Stuck sometime when adjusting. easy way to change weight for different exercises. If you’re looking for a complete workout tool that includes everything right down to the professional looking stand to keep your equipment in place and easy to find when you need it, the Ironmaster Quick-Lock Adjustable Dumbbell Set could be just the thing for you. You can quickly adjust each dumbbell from Five to Seventy Five lbs. with its protected quick lock design in less than Fifteen seconds! In a set you are getting a Stand with no extra charge. In one set there are 2 handles with 4 locking screws, twenty four 5 lbs. plates and four 2.5 lbs. plates and dumbbell stand included. 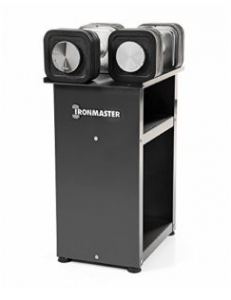 Dimensions of Ironmaster Quick–Lock Adjustable Dumbbells are 6.5x6.5x14.5(Inches) at the 75lb size. There is even an additional weight available up to 120-pounds each side available. The black and chrome adjustable dumbbells with stand are made up of clean lines and sleekness. They are very minimalistic. Full open-faced cabinet stand with storage Expensive. Comes with stand and exercise poster. Since 1983, StairMasterhas been making a name in the gym. The new TwistLockAdjustable Dumbbells let you change weights in 5lbs increments with the simple twist of a handle.The StairMasterTwistLock adjustable dumbbells may not be one of the most used set, but it is found that they are highly rated by the users so this is the reason why these dumbbells are in our list. With a range of Five lbs. to 50 lbs. the StairMasterTwistLock dumbbells offers a normal weight range to adjust with. The handle of the dumbbells weighs around Five lbs. which can be further adjust up in Five lbs. increments giving you a total of 10 different weight settings to choose from. The outstanding factor of StairMaster’sTwistlock adjustable dumbbells is that you have to only the handle to change weight settings. This is the factor which makes StairMaster’sTwistlock adjustable dumbbells one of a kind. The big drawback in using The Stairmaster TwistLock Dumbbells is that’s thetwistlock is made with plastic internals whichafter using for a time simply wears down. Also, there weight plates which are covered with a plastic shell mainly cracks down very easily. Good design which makes you to workout with better determination. Use so many plastic parts so not very durable. Space Saving. Weight are covered in shell- like plastic so they can crack easily. Rubber feet will prevent the floor from scratching or scrapping. Not budget friendly. Twistlocktechnique switchs the weight very quickly. 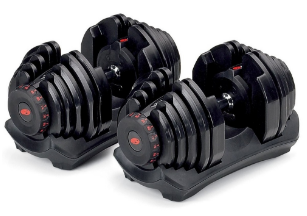 After PowerBlock Elite Adjustable Dumbbells here comes the PowerBlock Sport 24-Pound Adjustable Dumbbell Set which is versatile, space saving and very efficient. They are quite easy to adjust the weight to any level. Having a weight range of 3-24 pounds there is an increment of 3 pounds for the entire set making it show 7 different settings. Quick release pin on the PowerBlock Sport 24 Piece Dumbbell Set lets makes you exercise faster and efficiently with a space saving design all in one system. The Special feature of PowerBlock adjustable dumbbells is that they look less bulky than other adjustable systems, and haves an ergonomic design to protect your hands and help you keep good form through your exercise routine. The drawbacks are that the PowerBlock Sport uses a pin attachment system that can be a little tricky to use when attaching several layers of weights.However,a magnet in the pin helps keep the pin in place in an emergency. So this is the only issue you will face while using the PowerBlock Sport 24 Piece Dumbbell Set. Weight range from 3-24 pounds. Pin attachment system tricky to use. Rubberized handles gives secure grip. Expensive. Require less space hence saves space. Attractive black weights with colorful bar color coding gives a good look. These adjustable dumbbells by Titan Fitness are one of the widely used old school dumbbells in gym and homes due to their Cast Iron nature. These dumbbells are best to add weight upto 100lbs due to their strong Cast Iron rod. They are very cost effective because there are no additional features included other thanthe changing weight. Can save space of around 30-40 dumbbells at one so very much space effective too. Adjustable from 5lbs to 50 lbs. each- Includes4 collars, 2 handles and 24 plate. Chrome plated handled with a very firm and tight grip neglecting the slippery effect. Therefore when I also ordered these dumbbells and despite of all the tremendous features there was a drawback that the packaging for each dumbbell was horrific. The boxes were falling apart and the dumbbells were spilling out everywhere making me unable to carry the boxes. Space Saving. Difficult to carry weights. Chrome plated handle provides a firm grip. Strong Cast Iron plates are used. 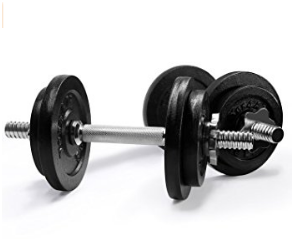 This Giantex 66lbs weight adjustable dumbbells set stands out the last of our top 20 list due to its nice, cheap and good home weight set nature. The bars are chrome plated and have a non-slip checkered finish where they are gripped having a weight of 2kg each. Consisting of eight weights of 2.5 kg and four of 1.5 kg plus the two bars at 2 kg each making them 30kg which is equivalent to sixty six lbs. The spin-on nuts allow the weights to be changed quickly and they hold them in place well. Hence these are not best quality dumbbells but can perform great set of exercise in less expensive manner. Saves Space. Shows signs of rust. Spin on nuts holds the weight in place.